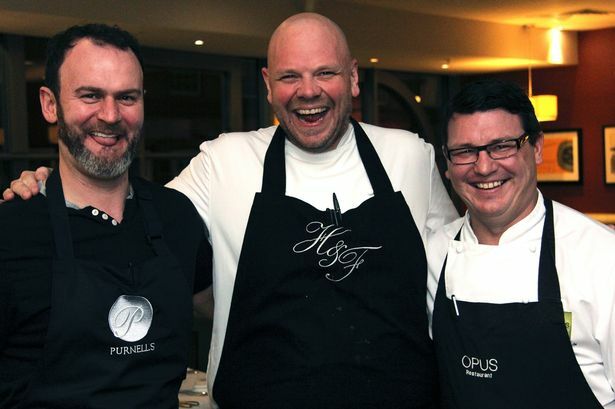 Tom Kerridge joined forces with local chefs Glynn Purnell and David Colcombe to create a special dinner in Birmingham. Glynn Purnell, Tom Kerridge and David Colcombe. Tom Kerridge, the two Michelin starred pub restaurateur and successful TV chef, joined forces with local chefs Glynn Purnell and David Colcombe to create a special dinner in Birmingham, further enhancing the growing culinary reputation within the city. Hosted at Opus, in Cornwall Street, Kerridge, who has recently experienced success with his book and television series Proper Pub Food, served guests a warm pork pie starter and half-roasted chicken main – favourites at his famed Buckinghamshire pub, the Hand & Flowers.